This past week I got my Avengers vs. X-Men fix. In round six of the twelve round series, we see what’s been happening since the Phoenix Five has taken control of things. Professor Xavier dropped by Pax Utopia to have a talk with Cyclops. I could feel his concern for Scott and the rest of his X-Men. During the conversation we learn that Cyclops has convinced himself that he is making the world exactly the way Professor X always wanted. Professor X on the other hand, thinks the Phoenix Five is cheating and not allowing nature to take its course. I’m going to have to side with Professor X on this one. Mankind might go backwards sometimes, but we always find a way to move forward again. What the Phoenix Five is doing is not allowing mankind the opportunity to move forward at a natural pace. We also see what’s happened to Hope since being taken by the Phoenix Five. Even though she’s been told she’s not a prisoner on Pax Utopia, she feels such a strong connection with the Phoenix that she can’t bring herself to leave. We later learn that although Cyclops says she is free to leave, when she finally decides to, he goes back on his word and tries to keep her on Utopia. Maybe its just me, but it looks like the artists can’t make up their mind how old Hope is. In one issue she looks sixteen. In this issue, there are times she looks like she’s around ten years old. I can understand with all the stress she is under that she might start to look different in each issue, but the stress should be making her look older, not younger. 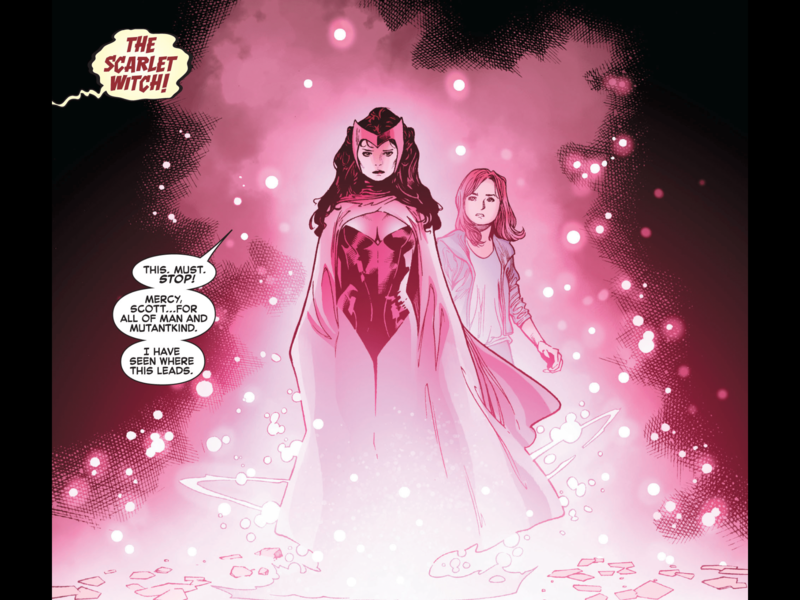 It’s no surprise to me that Scarlet Witch returned to help Hope. With everything she has been through, I could see her reaching out to help Hope. I’m curious to see how her involvement will change the tides of the fight. Before this whole thing started, more than half of those polled said they would be on the side of the Avengers. With the latest development in how the Phoenix Five are changing it to be a Utopia for all man-kind, many readers are starting to switch sides. I’m still on the side of the Avengers. The way the Phoenix Five is fixing the world is against nature and if the Phoenix ever leaves, mankind will slip back into its old habits. The next issue of Avengers vs. X-Men is scheduled for release next week. You can check out Avengers vs. X-Men at your local comic book shop, Comixology or Marvel Comics App. Earlier this month, I was pining for a new Marvel title to hook me. Coincidentally enough, my wish has been fulfilled in the form of the crossover mini-series Spider-Men . In the first issue, we are treated to a phenomenal inner monologue from Peter Parker as he swings above the streets of his beloved New York City. Peter’s thoughts are snappy and slightly poetic. More than that, his monologue accomplished something no other comic has for me: it caused a serious fit of giggles. 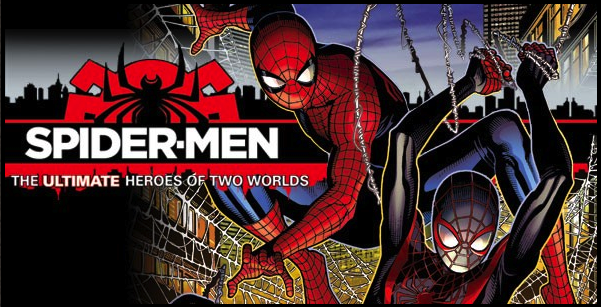 This five-issue series is billed as a history-making crossover as Peter comes face to face with Spider-Man from the Ultimate universe, Miles Morales. While I’m not yet acquainted with Miles, I can’t wait to learn more about him and see him and Peter slinging webs together. Spider-Men #1 finally has given me a reason to visit the Marvel universe every month. 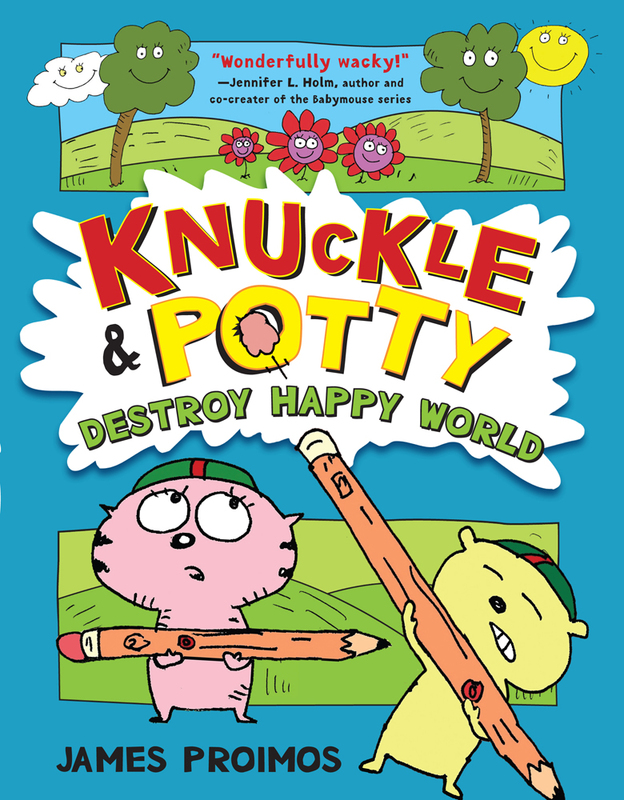 Knickle and Potty Destroy Happy World by James Proimos is quite, quite amusing. And silly. And pointless really. Absolutely perfect for the pre-teen set. Which comic book titles have you coming back regularly? In other words, what is on your monthly pull list? ← The Carousel of Happiness Spins with History.